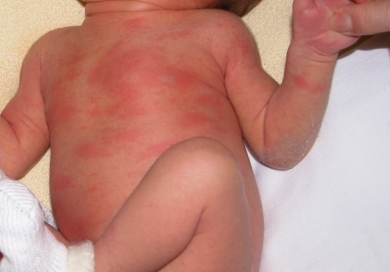 Neonatal Dermatoses - Different Types Explained with Pictures For Better Understanding. 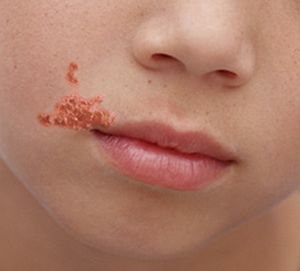 Skin disorders are one of the most common problems in pediatrics. Never underestimate parental concerns about their child’s skin. 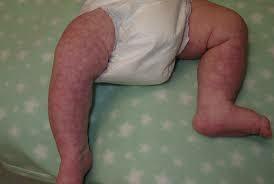 Unlike many disease processes, the skin is visible and noticeable to parents and others. Examination of the skin requires observation and palpation of the entire skin surface under good light. Do not forget to look at the eyes and mouth for mucous membrane involvement. Examination should include onset, duration, and inspection of a primary lesion. It is also important to note secondary changes, morphology, and distribution of the lesions. 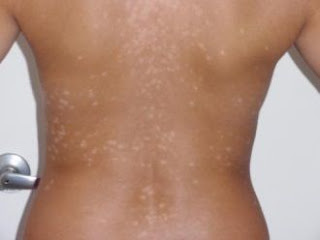 Transient, blanchable, reticulated mottling occurs on the skin exposed to a cool environment. No treatment is necessary; the condition generally resolves by 1 year of age. If it persists, consider hypothyroidism, heart disease, or other associated abnormalities. 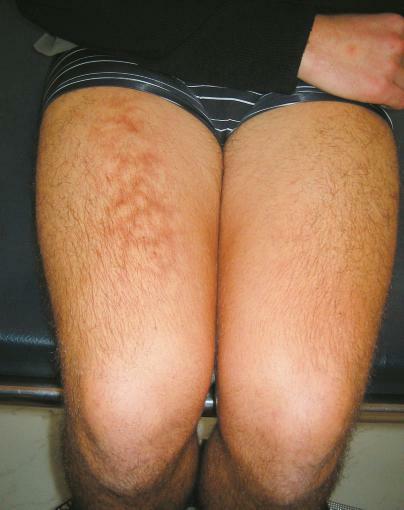 Scattered erythematous papules and pustules may occur anywhere on the body . This self-limited condition generally appears in the first week of life and resolves within 1 month. A 50-year-old male presented to the Emergency Room with shock and a four-day history of a febrile illness. He required intubation and was started on inotropes. • S wave in V1 + R wave in V6 or V5 is > 35 mm (S V1 + R V6 > 35 mm). (This criteria is applicable only above 25 years of age). • R in V5 (or V6) > 26 mm. • R in aVL > 11 mm (or 13 mm). • R in aVF > 20 mm (also in LII and LIII). • R in LI + S in LIII > 25 mm. • R in LI > 15 mm. • R in V6 is equal to or greater than R in V5 (normally R in V5 is taller than R in V6). • S in V1 or V2 > 25 mm. • Sum of all QRS in all 12 leads > 175 mm. 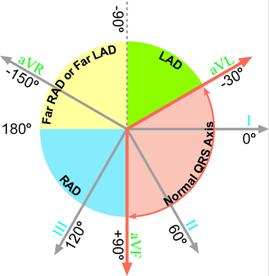 • Left axis deviation (QRS between –30° and –90°). It is important to note that: In young and thin person, this voltage criteria is not diagnostic (in younger person, S in V1 + R in V5 or V6 should be greater than 40 mm). Q. How to confirm the diagnosis of LVH? Q. What are the causes of LVH? 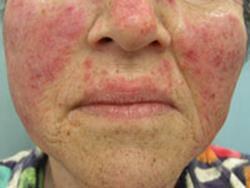 Drug-induced lupus erythematosus is a disorder that is brought on by a reaction to a medicine. In drug induced lupus not all the typical features of systemic lupus erythematosus are seen, with renal and nervous system involvement being unusual. It usually resolves on stopping the drug. An 80-year-old woman, who had previously had a few attacks of dizziness, fell and broke her hip. She is found to have a slow pulse, and her ECG is shown below. The surgeons want to operate as soon as possible but the anesthetist is unhappy. What does the ECG show and what should be done? The ventricular 'escape' rhythm has wide QRS complexes and abnormal T waves. A sexually active 24-year-old woman presents to your office complaining of vaginal discharge. A sexually active 24-year-old woman presents to your office complaining of vaginal discharge. Findings from a wet prep are pictured here. • Wide QRS complex, at least 120 ms (three small blocks). • T wave appears on the opposite side of the baseline from the QRS complex. • The QRS precordial axis is normal or deviated to the left. • QRS complex deflection is predominately downward in lead V1 and upward in lead V6. 1. The signal exiting the AV node does not proceed through the left ventricular conduction system. It must propagate more slowly cell-to-cell through the myocardium, starting in the septum. Therefore, the QRS is wider and the bulk of the depolarization signal is deflected toward the far lateral aspect of the heart. X-ray chest shows soft small ill-defined opacities scattered in both lung fields partially sparing the lower zones. On X-ray bronchopneumonia appears as small fluffy ill-defined acinar nodules, which coalesce and enlarge with time and may develop into segmental and lobar densities with volume loss from airway obstruction secondary to mucus plugging and bronchial narrowing. Bronchopneumonia is a combination of interstitial and alveolar disease. In bronchopneumonia the insult begins in airways, involves bronchovascular bundle and trickles into alveoli, which may develop and contain edema fluid, blood, leukocytes, hyaline membranes and organisms. Traumatic iridodialysis is the result of an injury, typically blunt trauma that pulls the iris away from the ciliary body. The resulting deformity appears as a lens-shaped defect at the outer margin of the iris. Traumatic Iridodialysis. The iris has pulled away from the ciliary body as a result of blunt trauma. A traumatic cataract is also seen. 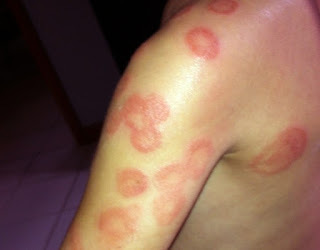 The rosette pattern is classically seen after contusion injuries. It is due to separation of lens fibers around lens sutures. a small amount of bleeding may result. Look closely for associated traumatic hyphema. lens dislocation causing billowing of the iris. This X ray is of a 25 year old male patient who presented with sudden onset of left sided chest pain. X ray Description: The CXR shows the visceral pleura separated from the parietal pleura by air which now occupies the potential space in the pleural cavity. The visceral pleura must not be mistaken for skin-fold shadows which usually occur in supine or obese patient CXR. In addition, the line from skin folds can be seen to cross the chest wall. Cardiac Axis Definition: It is the sum of all the depolarization waves as they spread through the ventricles as seen from the front. • Axis can be derived most easily from the amplitude of QRS complex in LI, LII and LIII. • The greatest amplitude of R wave in LI or LII or LIII indicates the proximity of cardiac axis to that lead. • The axis lies at 90° to the isoelectric complex, i.e. positive and negative deflections are equal in any of the lead LI, LII, LIII, aVL, aVR and aVF. Normal axis is between –30° to +90°. • Positive QRS in both LI and LII means axis is normal. • Positive QRS in LI and negative in LIII (tall R in LI and deep S in LIII)—means left axis deviation. • Negative QRS in LI and positive in LIII ((tall R in LIII and deep S in LI)—means right axis deviation. When the cardiac axis is between –30° to –90°. 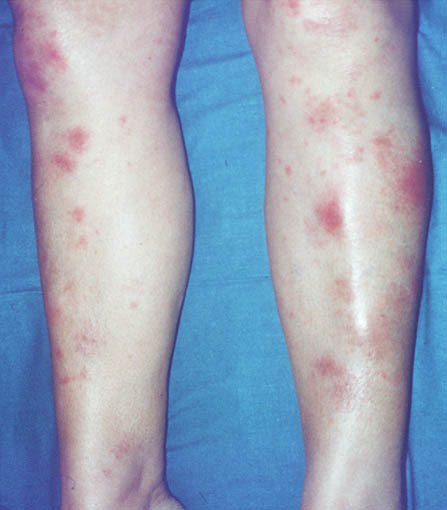 Discoid lupus erythematosus is a benign disorder generally seen in younger females. It very rarely progresses to systemic lupus erythematosus (in less than 5% of cases). 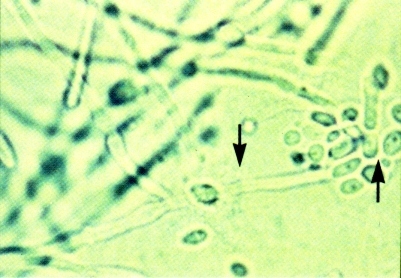 Discoid lupus erythematosus is characterized by follicular keratin plugs and is thought to be autoimmune in etiology. A 60 year Old Man Presenting With Vague Chest Pain On Exertion..
A 60-year-old man was seen as an out-patient, complaining of rather vague central chest pain on exertion. He had never had pain at rest. What does this ECG show and what would you do next? • QRS complex has sR’ or rsR’ in leads V1 and V2. • Slurred S wave leads V6 and I. 1. The signal exiting the AV node is carried rapidly to the LV through the intact left bundle, but is delayed into the right ventricle, where depolarization must propagate cell-to cell. Since the RV myocardial mass is much smaller than that of the LV, this delay in depolarization is best seen in the leads overlying the right ventricle, leads V1 and V2. 2. Acute right heart strain, as may occur with pulmonary embolism, may result in new onset right bundle branch block (RBBB). A 70 years old male patient with a long history of cough and general weakness. X-ray chest shows a mass lesion in right upper lobe (arrow), likely a bronchogenic carcinoma. To confirm the diagnosis, CT chest was performed. CT chest (shown in the picture below A&B) shows ill-defined rounded opacity abutting the chest wall with radiating strand seen in right upper lobe with minimal necrosis within, seen in mediastinal window. The CXR shows a focal shadow in the right lower lobe with air bronchograms suggestive of pneumonia. It is clearly in the right lower lobe because the right hemidiaphragm is effaced. Right middle lobe shadows would efface the right heart border. The presence of air bronchograms indicates pathology in the alveoli, as the conducting airways remain patent with air. Kerley B lines with pulmonary edema. Understanding A Normal ECG - Details about The Waves And Intervals. • Normal ECG recording consists of P wave (atrial beat), followed by QRS, ST and T wave (ventricular beat). • Capital letter P, Q, R, S, T—indicates large wave (> 5 mm). • Small letter p, q, r, s, t—indicates small wave (< 5 mm). • P — Deflection produced by atrial depolarization. • QRS — Deflection produced by ventricular depolarization. • Q (q) — First negative deflection produced by ventricular depolarization. It precedes R wave. • R(r) — First positive deflection produced by ventricular depolarization. • S(s) — Negative deflection after R wave produced by ventricular depolarization. • T — Indicates ventricular repolarization. • J — At the beginning of ST segment. • U — Not always seen. When present, it follows T wave, preceding the next P wave. It indicates repolarization of interventricular septum or slow repolarization of the ventricles. • PR interval — Distance between the beginning of P to beginning of QRS (Q), ideally called PQ interval. • PP interval — Distance between two successive P waves. In sinus rhythm, P-P interval is regular. • RR interval — Distance between two successive R waves. In sinus rhythm, R-R interval is regular. • QT interval — Distance interval between the beginning of Q wave and the end of T wave. ST—Distance from the end of QRS complex to the beginning of T wave. It indicates the beginning of ventricular repolarization. Normally, it is in isoelectric line, but may vary from – 0.5 to + 2 mm in chest leads. Eczema or Dermatitis is a term used to describe conditions in where there is inflammation of skin. There are several types of eczema and Discoid eczema is one type which causes round or oval red patches of inflamed skin. It is also known as Nummular dermatititis which means coin shaped lesions. Discoid eczema is usually seen in adults with dry skin although it can affect teenagers and young children, but this is rare.